The interior is nothing special. Its just what on would find in a standard ATX Case. There is the four 5.25� bays, three 3.5� external bays (only 1 can be used, since there is only 1 floppy opening on the case), and four 3.5� internal bays. Even high demanding computer enthusiasts won�t have to worry about not having enough space to put their optical drives and hard drives in this case. I also saw that there was the 400W power supply already mounted in the case. It supplies a maximum of 400 watts, which is a lot of power to pack and should be efficient for a little overclocking. The power supply is a generic one, which means that it really doesn�t have the same amount of power as 400w power supplies from Antec and Enermax would pack. That�s why overclocking a little bit would be ok but would not be really ideal for extreme overclocking, considering that this power supply is generic. Concerning the name on the label of the PSU, it only says �Switching Power Supply.� The power supply did not have a bottom fan, which really was a disappointment since having one would help in bring down the CPU temperature as well as the case temperature. 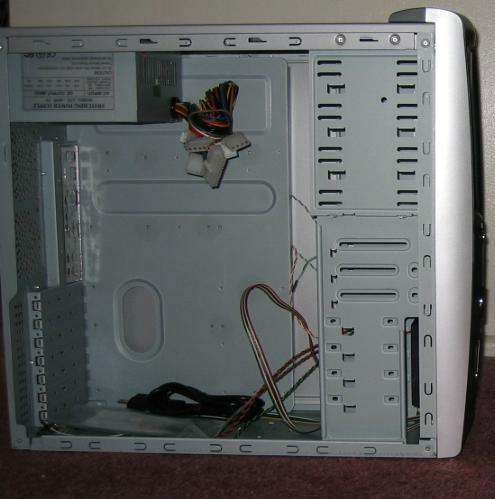 The power supply has only 4 molex leads, which isn�t much. Even though the included fans come with splitters (thereby not wasting any leads from the power supply), 4 molex connectors is really something to be happy about. But if you only have 2 optical drives and 2 hard drives at most without any additional power consuming devices, you should be fine. Otherwise you would have to buy some molex splitters, which aren�t expensive but nonetheless annoying in my opinion.